Date is exactly "1913 July 22"
B.C. LaFollette writes to the Assistant Secretary of the Treasury asking for the names of the three girls who violated the segregation policy at the Bureau of Engraving and Printing. 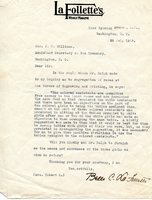 Jessie Wilson Sayre writes to Cary T. Grayson about the difficulties of findng proper golf clubs.